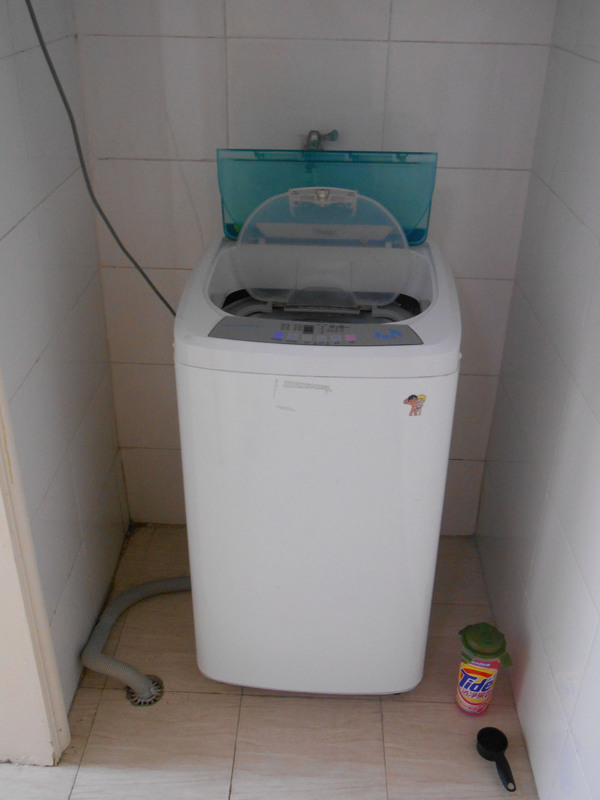 I’ve received a few questions about my apartment accommodations here so I thought I’d post a couple pictures of my household appliances so you can see what daily life in China is like. This is the view from my front window on the 4th floor looking out over campus. Here’s a picture of my front bathroom, complete with Turkish Toilet (aka squatty-potty). 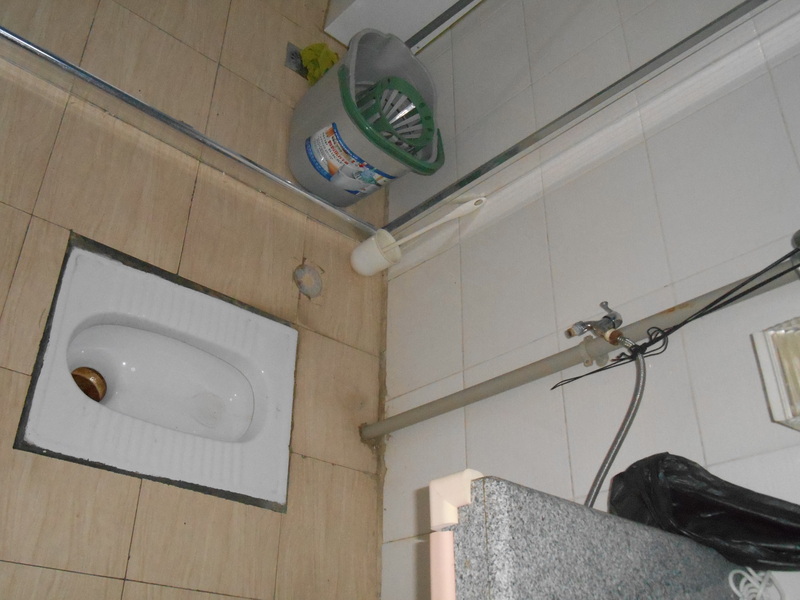 This may sound absurd but when I have my Chinesestudents over I’m going to have them use the front restroom here instead of letting them go through my bedroom to the western bathroom. 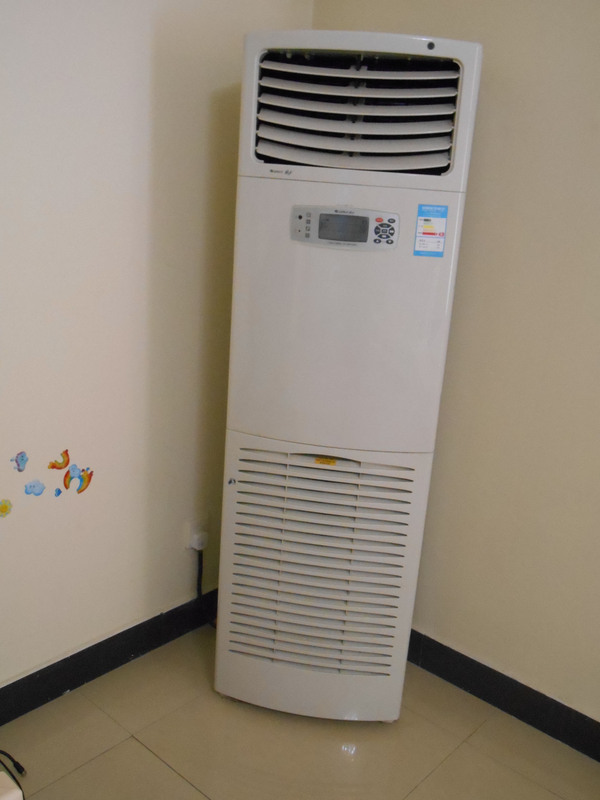 There is no central AC in China. This is my air conditioner/heater. It works pretty well for keeping everything cool so hopefully the heater will work as well otherwise I may have to invest in a space heater. This is my washing machine. I’m not sure I mentioned this before but all the buttons on everything are in Chinese so unless someone teaches you which buttons to push it’s just a shot-in-the-dark to get anything done. There is no adjitating unit in the washer so it slings my clothes around and stretches them out of shape. Also anything that is the slightest bit delicate must be washed in the sink. I normally use the front bathroom sink but there is no hot water, because those come from localized units as well in the master bath and kitchen sink. 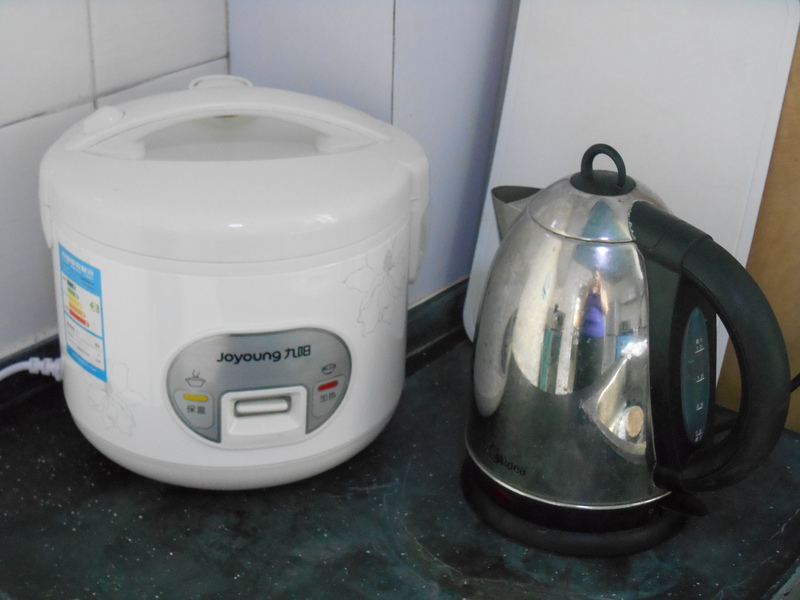 Here are my rice cooker and water boiling machine. I have used the water boiler a lot for drinking water. The first time I used the kitchen sink the water came out brownish. I thought my new dishes just had that much dirt and grime on them but alase it was the water. I’ve let it run for a long time now so it has cleared the pipes but there are sometimes still little floating particles in it. Things will be better after my school gets me a water machine, but it hasn’t come in yet. I’m going to ask Lillie about it again on Monday. The school is supposed to provide a commercial size water cooler with 5 gallon jug on it. The Chinese don’t cook very much other than rice and stir fry so the kitchens are super-small. This is the closest thing to an oven and stove top that I have. 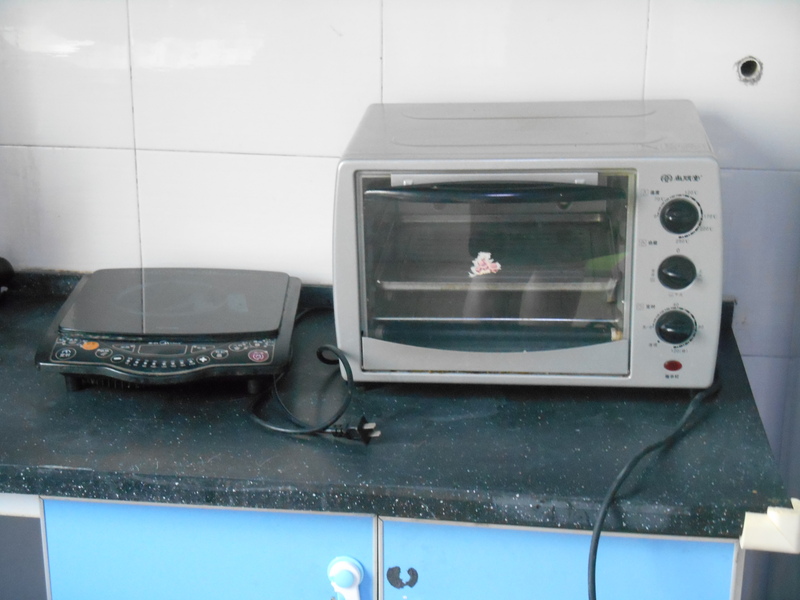 It’s a hot plate and toaster oven. That being said I should be able to make due and cook whatever I need with just those. 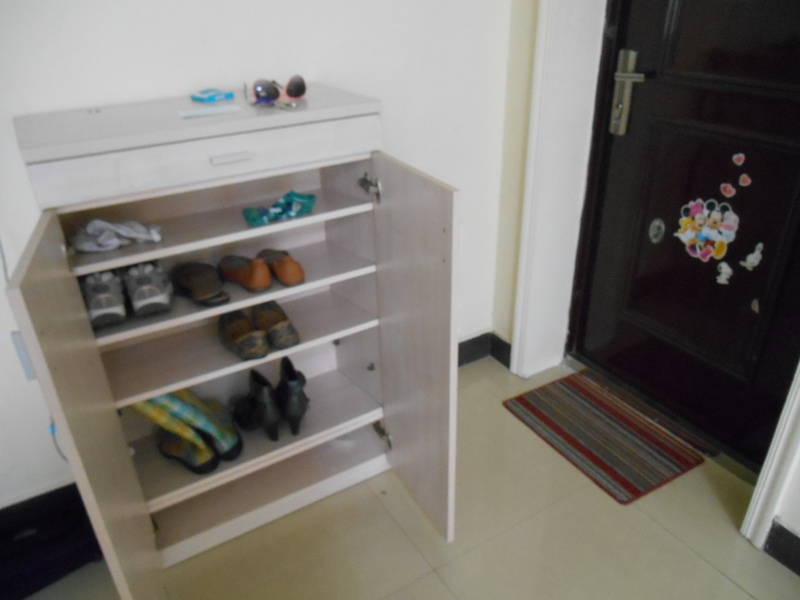 Lastly this is my shoe rack. Everyone takes off there shoes the moment they come in the house which is a good thing because the roads and stuff outside are super gross and there is always a thick layer of grime on the stairs going up to my apartment. It takes forever to mop the floors so I would like to keep them as clean as possible. I have a hypothesis that some of the grime is the air pollution settling back down to the ground. Isn’t that a pleasant thought? Until next time, I love you all and hope things are going well back home. 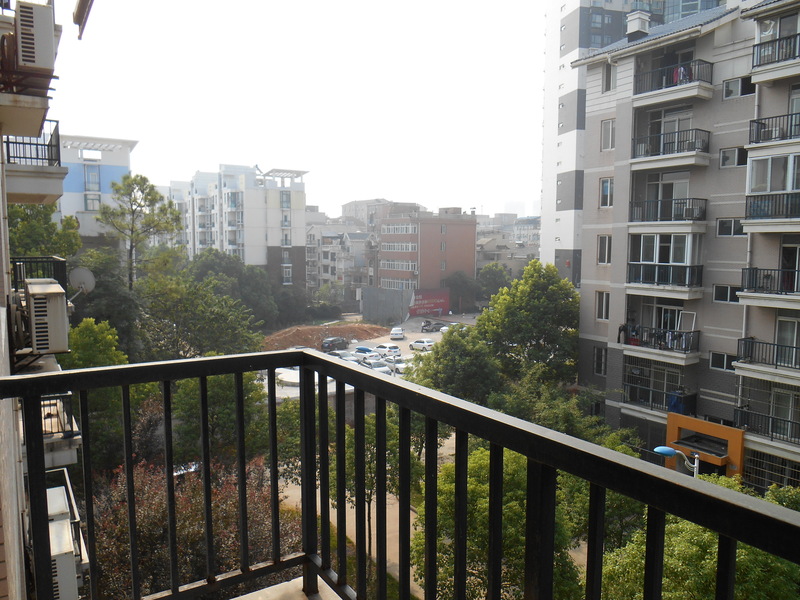 WOW apartments there are very different from over here…it must take some time to get use to. Thanks for sharing this with us. I would be going crazy over the water since I tend to drink a gallon a day, but I would be in love with all the rice. Do you shop at the markets there or is there a Wal-Mart nearby…LOL Please keep us updated…. I have only shopped at Walmart and Carrefour (a french grocery store). I visited the vegetable market today for the first time though with my friend Angela. It was really cool except it would be difficult to shop there and not speak English. I will probably ask my Chinese students to help me shop the first couple of times. I’ll do a post on Walmart and the Vegetable Market at some point for everyone. Thanks Mom. My first day is going very well. The kids are great and the lesson was easy. I’ll post an update at some point on how the classes are going. Glad you are settling in. Looks like one adventure after another! We are driving home from western KY (home) where we spent the weekend with family and going out on the lake. We celebrated Lily’s birthday with family. She turns 13 on Tuesday (3rd)!! I’ll show your girls your posts later this week so they can see what it’s like in China and how different it is from here! Hopefully we can Skype soon!